It's easy to assume that what we see and experience in our daily lives is 'the norm'. However, as astronomers learn more about our Universe, they're finding that sometimes the weird and wonderful stuff is actually more popular. For example, astronomers think there is about six times more invisible material in space than visible stuff! Astronomers call this invisible stuff 'dark matter'. This new space photo shows a huge collection of galaxies - a 'galaxy cluster' - that contains loads of dark matter. Although dark matter is invisible, astronomers can still work out where it is in space from the effect that its gravity has on the things around it - like seeing a sofa cushion being pushed down by an invisible man. In the photo, the gravity of both the visible and dark matter is so strong that it has bent the light coming from distant galaxies. In some cases, the effect is so strong that the galaxies look like they have been stretched into arc shapes! By looking at the distorted shapes of these galaxies, a team of astronomers has worked out how the invisible material is spread out in the galaxy cluster. Surprisingly, they found that the dark matter isn't spread out like a basketball, as they had expected, but that it is shaped more like an American football. Understanding how the dark matter is distributed will give astronomers many clues about how the Universe has grown and changed over time. 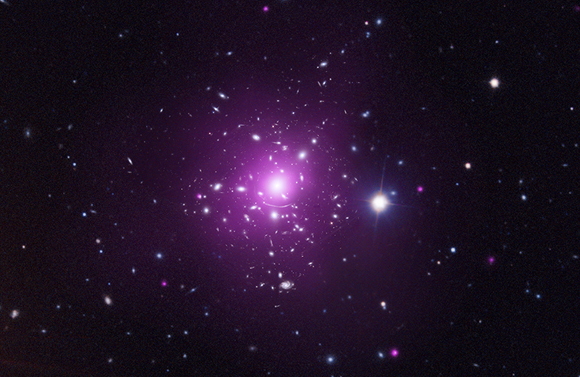 Cool fact: In addition to dark matter, there is also dark energy in the Universe. Dark energy isn't invisible material. But it's called dark energy because astronomers are in the dark about what it is! This Space Scoop is based on a NASA Chandra X-ray Observatory Press Release.